What is Australian grassland and rangeland assessment by spatial simulation? Year to year variation in rainfall has been a major factor contributing to both the degradation and recovery of Australia’s grasslands and rangelands. Degradation can be made worse by over-grazing – carrying of too many cattle or sheep, for too long, on areas under stress from drought (McKeon et al. 2004). The AussieGRASS model monitors key biophysical processes associated with pasture growth (i.e. degradation and recovery) at regional scales (e.g. local government areas or bioregions). AussieGRASS provides long-term time-series of rainfall and pasture growth information, as well as projections for the season ahead, which are useful for forage budgeting, assessing the impacts of drought, and bushfire risk. AussieGRASS (documented by Carter et al. 2000), is an advanced spatial water balance and plant growth model, producing output on a daily time-step across Australia. The model was initially built on the point-scale GRASP pasture simulation model (Rickert et al. 2000), using the SILO climate data base (Jeffrey et al. 2001), calibrated using satellite data, plus over 600,000 field pasture biomass observations (Hassett et al. 2000). The AussieGRASS system was developed using funding provided partially from the Land & Water Australia (LWA) Climate Variability Program in collaboration with WA, NSW, SA and NT, and has been operational on an Australia-wide basis since 1996. The AussieGRASS Product Guide (PDF, 3.5 MB) provides a semi-technical overview of the major operational products from the AussieGRASS system. It contains descriptions of various AussieGRASS outputs, how they are calculated and importantly the caveats applying to these products. The AussieGRASS User Guide (PDF, 6.0 MB) provides tutorial information for use of the AussieGRASS products to interpret maps,graphs and other analyses – with emphasis on sub-IBRA timeseries and map usage. The AussieGRASS Metadata Guide (PDF, 602 KB) is an information source to provide AussieGRASS GIS users (internal and external) with ‘need to know’ details to assist data manipulation and product analysis. 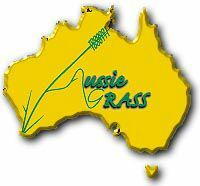 The Publications page lists a range of publications related to AussieGRASS.